Growing your family can pose a huge financial responsibility. Plus, as shocking as it may seem, many employees don’t receive paid maternity leave in the U.S. I definitely didn’t, which did create some financial stress. But luckily, I took the time to prepare and save what I could beforehand. This way I could focus on bonding with my baby and resting while I was out of work. Preparing financially for parenthood, as well as maternity leave, is crucial because you don’t know what’s going to happen. I have a friend who worked at a restaurant job. She actually got fired because she took several weeks off after having her daughter. The restaurant couldn’t hold her position, so she had to reapply when she was ready to come back to work. Although they agreed to rehire her, it all sounded like a huge hassle to me. It’s important to understand that 12 weeks of unpaid maternity leave is required by law, but your employer doesn’t have to pay you for your time off. Not having any income coming in while you’re on maternity leave can really hinder your finances when you’re supposed to be channeling all your energy and attention to your new child. If you fear you won’t have a paid maternity leave, be sure to keep these tips in mind so you can prepare your finances and be able to make ends meet during your time off. One of the great things about having a 9-month pregnancy term is that it gives you several months to prepare your finances and get ready to welcome the new addition to the family. While you stock up on baby gear, be sure to stash away some extra savings as well. Estimate how much you’ll need depending on how much time you wish to take off and set up automatic transfers to boost your emergency fund. You can also use bonuses from work, gift money, and your tax refund to boost your savings. If you combine finances with your spouse, discuss whether there will be a budget deficit or not when you stop working and decide how much you’ll need to save to fill the gap. However, it could help supplement your lack of income during that time especially if you are planning to cut expenses drastically and revert to your bare bones budget to save money. If you are able to work ahead at your job and get paid for the extra hours, it could help provide you with some income during maternity leave. If you have a flexible job or work as a freelancer, for example, you could ask for extra assignments so you can work ahead before going on leave. That way, you’ll still have some income coming in. If you ask, your boss may even let you work on a few tasks from home before you’re ready to give birth. If you’re feeling up to it, you can return to work early on a part-time or more flexible basis. This may stretch out your maternity leave. For example, you can see if your employer will let you ease back into working 3 days a week instead of 5 so you can still enjoy a few days off while taking care of your new baby. If you want to utilize your maternity leave to the fullest but don’t want to worry about money, see if your partner can get a side hustle to help bring in some extra money. Your spouse can do things like sell services on Fiverr, drive with Uber, or get a flexible part-time job. Find things that might fit for your family. Selling items you no longer want or need is a great way to make money fast that you can use while on maternity leave. If you will be taking leave during warm months, see if you can have a yard sale to earn money beforehand. You can also sell clothes and furniture locally, trade-in electronics, or sell items online as well. Many people don’t realize that postpartum depression is a common occurrence. It can prevent new moms from going back to work on-time. It may be worth looking into some short-term disability policies. Or, you could see what options your employer provides. This way you can compare the coverage offered for treating postpartum depression. If you’re pregnant or have a partner who is expecting, be sure to discuss maternity leave options. Decide how you’ll handle unpaid maternity leave as early as possible to avoid financial stress. Start exploring all the options you have. You might even consider negotiating some paid maternity leave with your employer if they don’t offer it. Most people don’t do this but it’s worth a try. 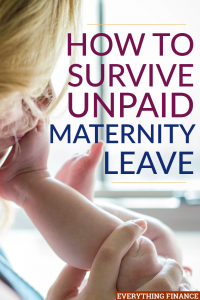 Have you ever had to experience unpaid maternity leave?